This review is about another plug and play retro video game system. We have previously done a review on similar type video game systems such as the Power Player Super Joystick and Game Fillip. This one is called "Power Games" or "Powerzone." I am not sure of what the real name of it is because I have ordered it two different times and the packaging of it was different both times. This is not important to me. The packaging of the item is no big deal to me, I just wanted to point this out. Either way, the plug and play retro game console is a "Penguin." Both of the times I ordered, everything inside the packaging was exactly the same. You get everything that you need including the Penguin console, the A/V wires, the plug for the wall, the power gun and two controllers. Just as all of the other plug and play systems of this type I have bought in the past, the power gun does not work on my televisions. This is because it will not work on modern televisions. A person must have an old tube television for the power gun to work. I'm sure that there is not many of us who have those around anymore. The controllers for the Power Games system are wireless. This is pretty unique as I have never seen any of these types of systems before that came with wireless controllers. Actually, this is the main reason that I ordered the Power Games Powerzone Penguin system when I first discovered it online. The controllers run on regular AA batteries. 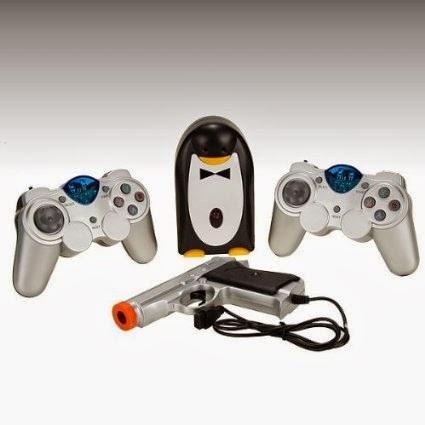 When playing, a player must always have the controllers pointed toward the Penguin console or else it will not work correctly. After some use, if the controller seems to not be working right, the problem will be that the batteries are going low. When I initially ordered the Penguin, even though I knew that the console was shaped like a penguin, it was really weird when I first received it. I don't mean that in a bad way. It is actually pretty neat the way they made it. The outer part of the Penguin is black, the inner part is white and the penguin has a bow tie on. The mouth part, or the beak of the Penguin is the power button to turn the console on and off, and when the system is turned on, there are two little red lights on above the mouth that look like the Penguin's eyes. The games on the system are some of the popular 80s retro video games such as Street Fighter, Super Mario Brothers, Donkey Kong, Dig Dug, Circus Charlie, Galaxian and many more. There are a total of 111 video games on the Penguin console. There are some games on the system that are less popular and that I had never heard of before. I'm not sure if these were games that were famous in other places besides the United States, but they are 8-bit games from the same era. Like I said though, if you are a person who knows 80s video games, you will know the vast majority of games on the Penguin system. Overall, I had no big complaints with the Powerzone. Do I like it better than some of the other plug and play systems out there? Actually, I do not notice any big differences. The only thing that sets this system apart from others is the wireless control feature. If you are a person who like to relax far away from your television while playing, I would recommend the Power Games Powerzone Penguin to you. It is very understandable that a person may want to sit on their couch playing games without a wire running across their living room or bedroom. If you don't mind sitting a bit closer to your television, I would say just go on ahead and get a plug and play system like the Power Player.